WHAT WE FILIPINOS SHOULD KNOW: Some of us may know a friend or relative who has earned a study grant as a "Fulbright scholar," and thus familiar with the name. Senator Fulbright wrote books such as the "Arrogance of Power" (1966), "The Pentagon Propaganda Machine" (1970), "The Crippled Giant: American Foreign Policy and its Domestic Consequences" (1972), "The Price of the Empire" (1989), etc. Fulbright was the longest serving and most powerful chair of the Senate Foreign Relations Committee. He was also the most prominent, and the most effective, of the first American critics of the Vietnam War. Fulbright's criticism was particularly galling and damning to Lyndon Johnson because Fulbright was a principled internationalist who could not be dismissed as an ideologue. Fulbright used hearings by the Foreign Relations Committee as a forum in which to advance his powerful critique of the war. 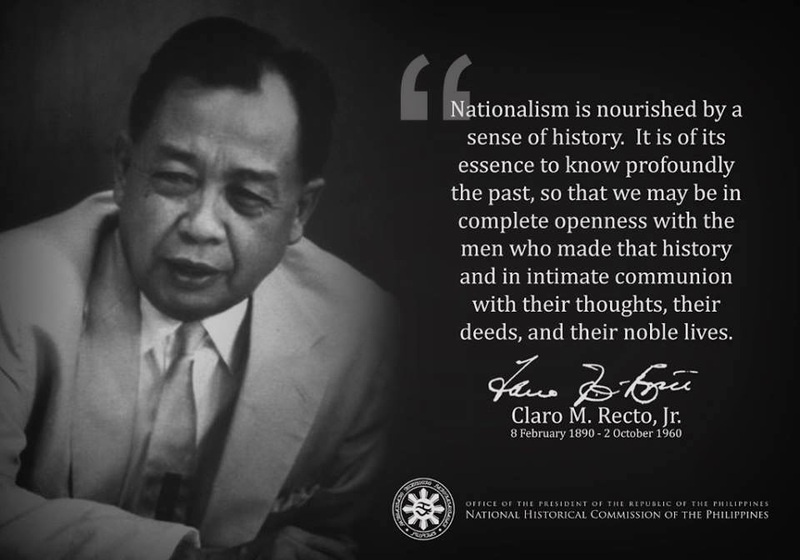 Below is what he said about nationalism during the Vietnam War. It sounds familiar even today. Deja vu! Now with the quagmire brought about by the Iraqi Invasion, with the new excuse/spin of "fighting terrorism" and "spreading democracy", etc. as modeled from the U.S. intervention/occupation of our homeland. The new spin is now used since the old rationale of "containing or fighting communism" is now moot -given that communism is practically the God that failed. America, due to its self-righteous ignorance/arrogance, desire and action to bully the world, and insatiable greed (the logic of capitalism), creates its own monsters, a self-fulfilling prophecy. America's leaders never learn to respect other peoples' society and sovereignty. Despite being the wealthiest and militarily, the strongest country since the start of the 20th century; their war-mongering results only in their young soldiers fighting for nebulous rationalizations and thus dying needlessly. Looking beyond a possible settlement of the Vietnamese War, it may be that the major lesson of trhis tragic conflict will be a new appreciation of the power of nationalism in Southeast Asia and, indeed, in all of the world's emerging nations. Generally, American foreign policy in Asia, in Africa and in latin America has been successful and constructive as far as American aims have coincided with the national aims of the people concerned. The tragedy of Vietnam is that for many reasons, including the intransigence of a colonial power and the initial failure of the United States to appreciate the consequences of of that intransigence, the nationalist movement became associated with and largely subordinated to the Communist movement. In the postwar era it has been demonstrated repeatedly that nationalism is a stronger force than communism and that the association of the two, which has created so many diffilcuties for the United States, in neither inevitable nor neutral. In the past, it has come about when, for one reason or another, the West has set itself in opposition to the natural aspirations of the emerging peoples. It is to be hoped that in the future the United States will leave no country in doubt as to its friendship and support for legitimate national aspirations. If we do this, we will find ourselves in another conflict like the one in Vietnam.